Finding Heaven: The SDG Train, Party, and Giveaway! This week, I'm doing a 7 day cleanse. One is supposed to give up both caffeine and alcohol in order to get the maximum benefit, but I'm keeping my coffee, especially on Monday morning. It's hard to articulate all that He's been saying to me in a fluid way, but I want you to know, so I'm going to the whole bullet point system. SDG isn't about eloquence. It's about authenticity. Last week, I didn't tell you all the different ideas God had put in my head about the future site of SDG, but at least two of them y'all confirmed in your comments. The one I'm most excited about? We are going to have contributors on different (yes, you can be one!) topics. We will then catalogue all of these posts on a page on the site for sisters to come and use as a resource. For example, we might have several people who have struggled with overcoming sexual abuse. Those will be under one heading so someone can come and hear multiple stories and have multiple resources as she goes about her journey. God has been insistent that this is His project. My theme verse for this new season is Matthew 11:28-30. When website construction gets hairy, He's quick to tell me to step away from the computer and come back later. This time, He said, "Don't touch it until Tuesday." He reminds me: 1) There is no rush. 2) This is not about self-reliance and pushing through. 3) When the burden feels heavy, it's not God's burden He designed for me to carry. In related news, I have a new mantra: Beach Mama Mentality. It reminds me to slow, to rest, to trust that I don't have to be in charge of everything all the time. To help me remember this theme, I'm planning a FUN! adventure to Hobby Lobby to make myself some sort of sign. If you see on FB or something that I have LOST my Beach Mama Mentality, feel free to tell me to go back and read my sign. And if you don't see my sign up here next week for our last SDG link-up, you can post in the comments: "Where is your sign???" Seriously, people. I need accountability for things like this. I have been overwhelmed by the graciousness of this community. Y'all are just stellar. You're true friends. I have had so many offers of help and it just confirms this: I do not drive the SDG train. God does. 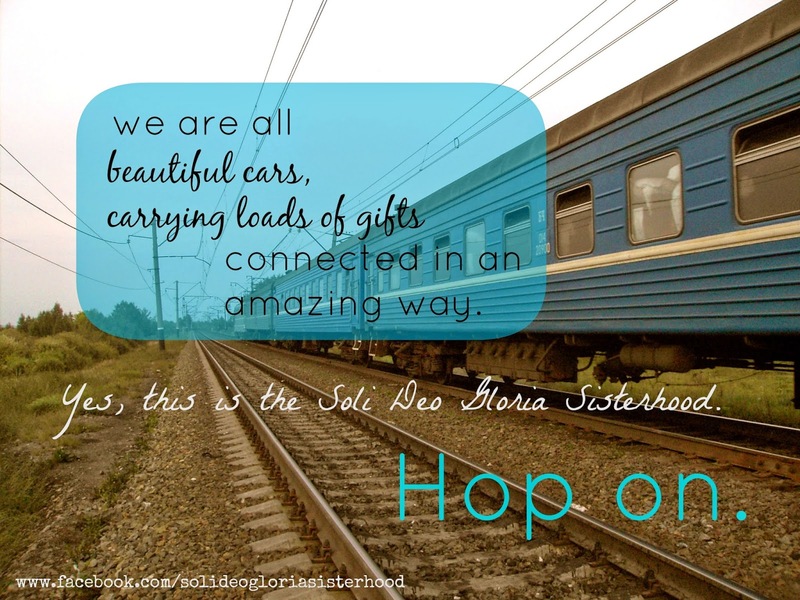 We are all beautiful cars carrying loads of gifts, connected to each other in amazing ways. The train doesn't look the same without you and I am really glad you're on this journey with me. An authentic journey that has stood the test of time. My favorite one is called Knowing My God: Jesus Saves Me. (Why? I don't know if it is because the sermon on Sunday was about Jesus being our Shepherd or because I am in a space in my life where I am hearing Him speak to me in abundance). The book teaches kids that Jesus watches over them, that He is good, and that we can know Him intimately, and that we can know His voice. I love that my kids know Jesus can and does speak to them -- it has helped them already make some really hard decisions in their lives. Truthfully, as adults, we could stand to visit some basic principles of our faith, to be reminded of who God is and how He works powerfully in our lives. In the second book, Close as Breath, she draws a parallel between air and God. Neither one are we capable of seeing or holding, but this doesn't mean He isn't right here with us. We just have to be open to Him revealing Himself to us in a myriad of ways. How many times have I doubted because I couldn't see? How many times have you? The publisher, Graham Blanchard, also has support and additional resources to help parents teach their kids about God. I didn't spend tons of time on the site, but did read their statement of faith. Pretty right on. 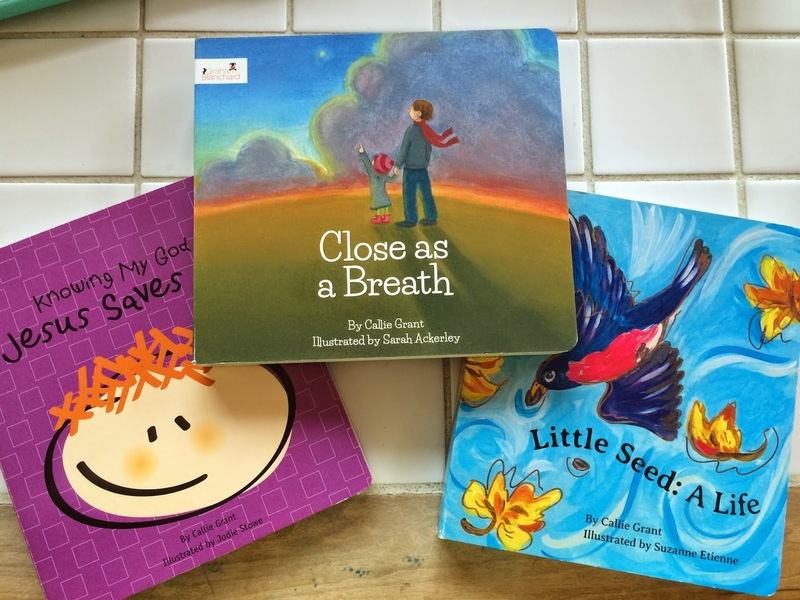 Do you have a special child you'd love to share these books with? If so, use the rafflecopter widget below to enter! I received these books free of charged and was not asked to give a positive review. These opinions are my own. Now, time to link up your heart and share with us. Please lift up another sister next to you and bring her some encouragement today after you link up! And, if you have any other thoughts/ideas about SDG, I'd love to hear them! I LOVE ----> "...I'm staying home and going inward a bit. I'm listening a lot to Jesus. And I'm remembering that His voice does much more to sustain me than a glass (or two) of wine at the end of the day. (So in theory, I'm sure His voice could be even more invigorating than coffee, but I'm not trying that experiment yet.)" Can I use these reminders too? :) Love them. And love you, Jen. "1) There is no rush. 2) This is not about self-reliance and pushing through. 3) When the burden feels heavy, it's not God's burden He designed for me to carry." 1. I still love your contributors idea. The more I hear about it the more I like it. God uses stories in a mighty way. 2. Our sermon on Sunday was about Jesus being the Shepherd too!!! How fun is that?! Anyway - also in church Cate and I had a whisper conversation about salvation and taking communion. God's definitely working in that department. I love you. Hope your birthday was happy! Beach Mama Mentality. I love it. I need some more of that *chill* attitude in my life. I sometimes get myself so worked up about the dumbest (and non-essential) things. So, I'll pull up my little beach chair next to you, and share a cup of iced tea (iced coffee???) and we'll just relax in the knowledge that God's got it all covered! Good Morning - I think at times we all need a stretch of time to "just be". It does a body good! I loved the little books & the web site. Had never heard of them before. Being a Mimi of 2 little girls, they would definitely go to them and/or their class (so all the kids could benefit from them). Thank you for the opportunity! I would read them to my two little girls. Thank you for the chance to win! I'm looking forward to seeing the Beach Mama sign--bet it'll be way cool. And I'm looking forward to all the (good) SDG changes in store. Good job being the engineer!